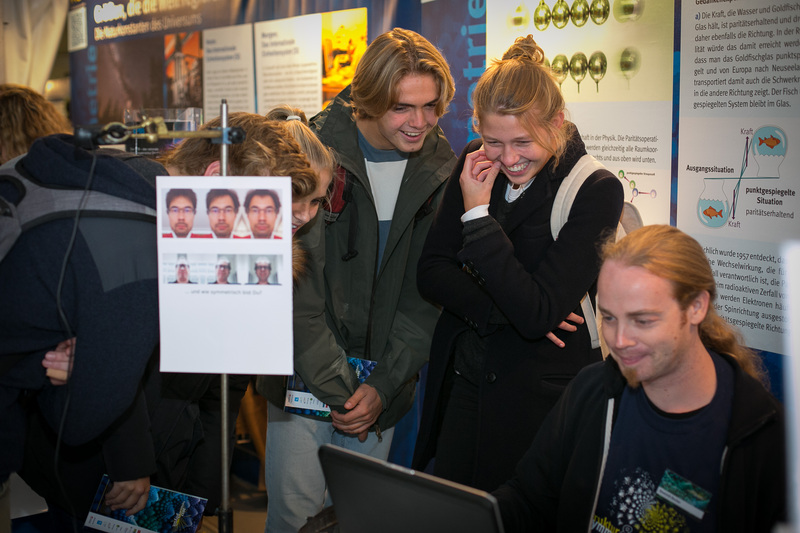 More than 50.000 visitors attended the science festival „Highlights of Physics“ in Münster from September 18 - 23, 2017. Under this year's motto „Structure and Symmetry“ the focus was on the latest research of particle physics to geophysics. PRISMA member Professor Dr. Frank Maas and four of his team members were invited to present the P2 experiment at MESA to the public. The P2 collaboration aims for a high precision measurement of the parity violating asymmetry in the elastic scattering of polarized electrons off unpolarized nuclei. The expected data will be interpreted as a determination of the weak mixing angle, one of the fundamental parameters of the Standard Model, with a precision competitive to the measurements at LEP or LHC. "Highlights of Physics" is an annual event that is organised by the Federal Ministry of Education and Research, The Deutsche Physikalische Gesell­schaft e. V. (DPG) and the respective hosting university and is supported by many institutions. Especially school students are attracted by the numerous workshops and join-in projects. The scientists of the P2 Collaboration got into conversation with many interested visitors during their one week presence at the science festival.